The "Special Needs" Planning Group is an organization that is made up entirely of parents of people with disabilities. We feel that this is important since we believe that no one can simply read a book and truly understand the feelings and concerns that parents have with respect to the needs of their sons or daughters with disabilities. We are experienced, knowledgeable professionals who understand the issues because we are living those issues. We are not experimenting with your family member’s situation. We use a team approach to planning using Planners, Lawyers and Accountants, all of whom are specialists in planning for people with disabilities and we provide solutions which include much more than just a will and a trust account. Graeme Treeby is the parent of 3 children, the youngest of whom is named Jenny. Jenny has Cerebral Palsy, Developmental Delay, PDD and a number of other issues. 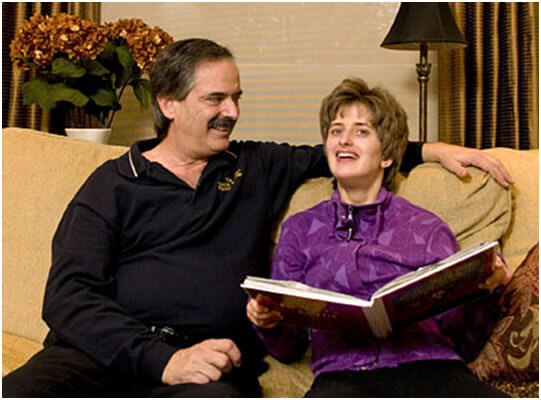 In 1990, he and his wife first entered into the realm of planning for people with disabilities when they attempted to plan for Jenny's financial future. It was at that point when they came to realize that there were a multitude of questions, but few answers. Over the next several years, he and his wife researched the issues and ultimately discovered that there were affordable planning tools and techniques which would allow them to provide for Jenny's long term needs. It seemed logical for Graeme to permanently give up his Accounting Career to share this information with other families throughout the province of Ontario. Since 1993, that is exactly what he has done. In 1997 he founded The "Special Needs" Planning Group. Through this organization, he has concentrated his efforts on sharing information with families in Ontario regarding the funding of Discretionary (Henson) Trusts, acquiring government benefits today and providing a decent quality of life for our sons and daughters with disabilities in the future. As a Life Insurance Broker, he has never had to charge a fee for his services so the information he shares is accessible to everyone no matter what their financial situation. Those who have worked with Graeme have achieved the peace of mind of knowing that their son's or daughter's quality of life will continue to be enhanced for their entire lifetime. Graeme's other interests have included past service on the Board of Directors of Community Living York South, and serving on various committees within that organization. He also spent 14 years as a disability/financial consultant with the Ontario Federation for Cerebral Palsy. The Special Needs Planning Group is a One-of-a-Kind organization which has been serving the Special Needs Community in Ontario for over two decades. What makes us a cut above the rest? Our ONLY Focus is Your Son or Daughter: Planning for a decent quality of life for a person with a disability requires our full attention. This is not a “sideline” or “add on” for us...nor do we use your child’s needs as a “foot in the door” to sell you other products. Parents of People With Disabilities: Each of our representatives is a parent of a person with a disability. We understand the issues because we are living them every day. The Voice of Experience: With over 22 years of direct experience in planning for people with disabilities, we speak with a solid knowledge base. We are not learning at the expense of your child. Team of Specialists: We have developed a team of Accountants, Lawyers and Planners, all of whom are specialists in planning for people with disabilities. Trustee Training and Support: Henson Trusts require Trustees with knowledge and multiple skills. Our Trustee Support Program guides your Trustees through the maze of rules and regulations of the Trustee Act and ODSP Act. Disability Author: Our founder, Graeme Treeby, is the author of Removing the Mystery, an Estate Planning Gide for Parents of People with Disabilities and The Trustee Reference Manual. Both publications have become the “Go To” planning reference material. Meet in Your Home: We don’t put you through the stress of finding someone to care for your son or daughter while you meet with us. We are always pleased to meet with you conveniently in your home during the daytime or evenings. Comprehensive Planning: We bring the pieces of the planning puzzle together. Our Plans include Wills, Henson Trusts, Life Insurance, Investments, RDSP’s, Planning Guides, Planning Manuals and a variety of other pieces of the planning puzzle. The result is a Plan tailored to the needs of your family. No Fees: The financial cost of providing for our sons and daughters is high enough without having to pay to plan for their futures. We don’t charge any fees for our services. Our Mission Is to Help Create Peace of Mind for Families of People with Disabilities. Two publications written by Graeme Treeby are Removing the Mystery: An Estate Planning Guide for Families of People With a Disability and Trustee Reference Manual - A Guide for Trustees of a Henson Trust.